Swage assembly is a method of mechanically fastening pin terminals to a circuit board, similar in style to riveting. It is commonly used with solder terminals and printed circuit board pins for low to medium volume applications. The swaging technique captures the board between the flared or swaged material and the shoulder of the pin, fastening the pin to the board. The turret terminal shown to the right, commonly used to solder heavy gauge wires from a cable to a circuit board, is a typical example of a swage fastened pin. Swaging is accomplished by using a punch and anvil tooling arrangement along with a manual or automatic press, the type depending on the volume of parts being processed. The hollow shank of the terminal is passed through the board hole. The swage punch forming tool is driven into the hole of the terminal, flaring out and compressing the protruding material to secure the terminal to the PCB. After installation on a board with plated through-holes and/or pads, the terminal is typically soldered to provide a reliable electrical and mechanical connection. should be met: the pre-swaged terminal shank should extend at least .022" above the circuit board surface so there is sufficient pin material to form and flare; the circuit board hole diameter should typically be no more than .004" greater than the pre-swaged terminal shank diameter. Note: to prevent cracking of the flared section of the terminal pin during forming, the Brass alloy pin material is annealed to a softer Rockwell Hardness (20-50 Rockwell B). Mil-T-55155 provides guidance for inspecting a swaged terminal. on the terminal chosen and the specifications of the PCB. Sometimes the pins are pushed into the board holes first, while other times the pins maybe placed in the anvil and then the board set on the pins. In any case, the swage punch tool is driven into the hole and flares out the material of the supported terminal to fasten the pin to the board. Are there devices or other obstructions located near the swage pin which may physically interfere with the positioning of the swage tooling? Will you be able to properly support the board to prevent bowing and breaking? Does your board thickness (including tolerance) allow for at least .022" of terminal shank protrusion? Are you looking to swage assemble a single terminal or an array of terminals? This will determine if you need a single swage punch or a ganged swage punch. What is the quantity of pins you have to swage? 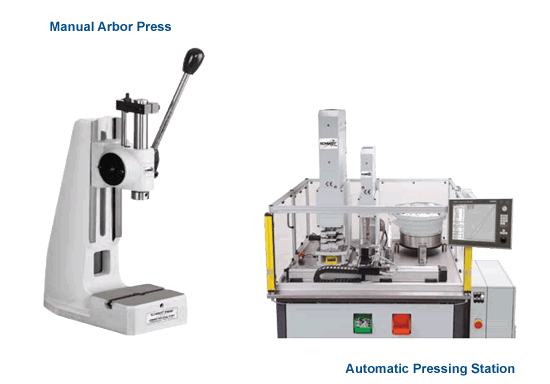 There are manual, semi-automatic and fully automatic presses available in different sizes and pressing capacities for you to choose from. Swage tooling, designed specifically for Mill-Max terminals is available from our partner Electronic Hardware Ltd. located in Southern California. Contact them today for your specific tooling requirement.